At the Jewish Life Centre, we pride ourselves in offering a diverse and exciting range of Torah classes. On any given week, we offer over 30 classes that range from Talmud to practical parenting to personal development. We are now excited to welcome Rabbi Aron Grinshtein to our teaching staff. Rabbi Grinshtein is young, dynamic and has been teaching and inspiring for a decade. Rabbi Grinshtein will join our men's afternoon learning programme. 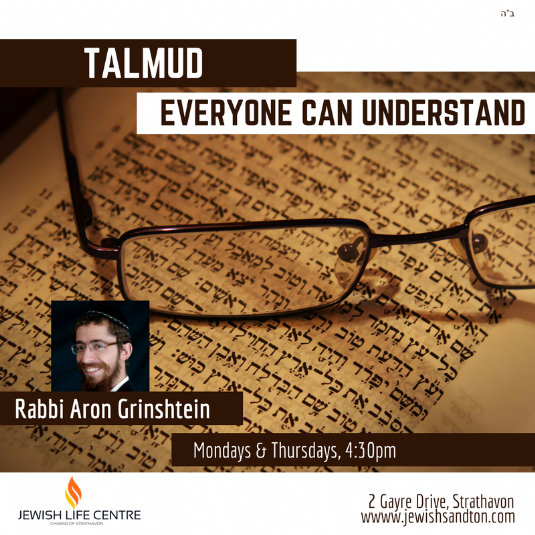 He will teach Talmud in a unique fashion- sharing the concepts, rather than wading through the text. Rabbo Grinshtein's new class starts on the 5th February and will run on Mondays and Thursdays at 4:30pm.